tiny wine blog: I like drinking wine. I also like buying wine. I like drinking wine. I also like buying wine. The grape is called trepat. I don’t have it in my little wine reference book. It’s also not on my varietal table poster that I have. It is in the Oxford. It’s a grape grown in northeast Spain; although not much of it is grown in general. Apparently it’s traditionally used in rose and cava, but people have started making red wines with it. Josep Foraster is the producer and they are located in the Conca de Barbera region in Spain; it’s in the top right corner of Spain. I enjoyed this wine, but I don’t recall that much about it. I do remember sitting on the couch with the last sip of it in my glass and thinking, “I should write some quick notes about it before I drink it all”. Then I drank it all. The wines from this region always seem to have pretty labels. In eastern France, near the border with Switzerland, is the mountainous region of Savoie. This area was part of the House of Savoy that was based in northern Italy. The producer for this particular wine is Roger Labbe and the grape is Mondeuse. I haven’t studied this region that much, but knew that the majority of the wines were white. Maybe I shouldn’t mention this, but when I got home I thought this was a white wine (it’s a dark glass bottle). Nope. It’s red. Mondeuse is the classic red red grape for this region. It’s quite tasty and reminded me a bit of gamay from the Beaujolais Cru areas as it was juicy and had tiny notes of violet/floral; but it seems to have more spice to it. When I bought this bottle, I was warned that it could have a bit of sulphur on the nose and that it would probably blow off after a little bit of time. It was very sulphur-y; even the next day. The producer is Domaine Santorini and they are located on the island of Santorini in Greece. The grape used for this wine is assyrtiko. It’s pronounced “A seer' tee ko” and not “Assy-Tiko”. It’s an interesting grape as it can age well and has citrus flavors as well as ‘white flower’ notes. Apart from the sulphur in our bottle, it would make a nice perfume. I/We need to drink more Greek wines. Oh, chenin blanc. This is a grape that I’m hot/lukewarm for (note that I didn’t say hot/cold). There are some brilliant chenin blanc based wines out there, especially in the great Loire Valley. These wines have a lot going for them: great with food, age beautifully, and can be produced in a variety of styles from dry to rich and sweet. 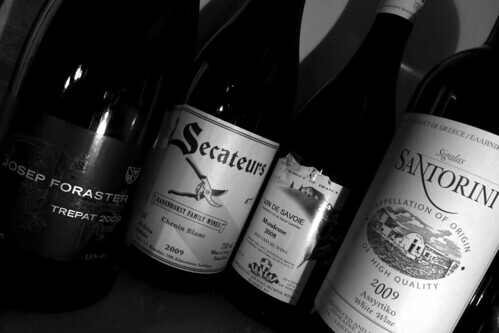 The ‘lukewarm’ is that there is a lot of chenin blanc out there that is just boring. The producer for this wine is A A Badenhorst and it comes from the Swartland region that is north of Cape Town in South Africa. Unfortunately I opened this bottle the night before we had to leave town and spent most of the time packing and doing last minute things instead of paying attention to the wine. I do recall mentioning to my lovely wife that the wine was pretty hot (in terms of having high alcohol). I’m sure this wine was lovely, though.